The video was forwarded to me by Rick Phillips at UFO Disclosure Countdown Clock. Is this a hoax? news.com.au - South African officials have euthanised the country's most famous baboon, known as Fred, who was well-known for raiding cars and frightening tourists along Cape Town's scenic route. Fred was the ringleader of a group of baboons infamous for breaking into cars to chow down on sandwiches and snacks. Cape Town's baboon management group said he was euthanised overnight because he was becoming increasingly aggressive. "The decision to have him euthanised was not taken lightly and not without extensive discussions between all role players involved," the group said in a statement. "This baboon's aggression levels had recently escalated to the point where the safety of tourists, motorists and other travellers along the road past Smitswinkel Bay was being threatened." In 2009, Fred led a group of 29 baboons in a four-car raid outside Simon's Town, a small coastal neighbourhood. The baboon chief used his signature tactic of opening unlocked doors and jumping through windows to search for food, while the rest looked for access inside from car roofs and bonnets. Baboons are a protected species under South African legislation but their aggressive pursuits of food have led to conflicts with residents. Cape Town's baboon management group said as baboons are exposed to human food, rich in carbohydrates, they are becoming increasingly intent on getting more of it - and increasingly dangerous. People caught feeding baboons are liable for a fine of 1500 rand ($215). "Unfortunately, this baboon's demise can be contributed mainly to the continuous misguided efforts by humans to befriend and feed baboons," the group's statement said. "Because people want to love, laugh at and be entertained by baboons, they start a cycle of events that can lead to tragedy, as in the case of this baboon." 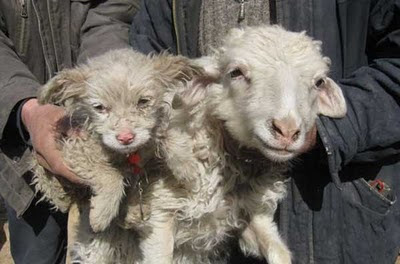 A Chinese farmer claims that one of his sheep has given birth to a puppy. The 'puppy' has wool like a lamb but it's mouth, nose, eyes, paws and tail look more like a dog's. Vets say it is impossible for a sheep to give birth to a dog - but people have been flocking to Liu Naiying's farm to see the animal for themselves. Liu, of in Fugu County, Shaanxi Province, says his 'sheep dog' even plays like a puppy. He told how he found the unusual baby animal shortly after it was born in one of his fields. Yue Guozhang, a researcher at Xi'an City Animal Husbandry Technology Centre, said sheep and dogs were different species. "It's not possible that a sheep could become pregnant with a puppy," he said. "It's likely that this is just an abnormal lamb."